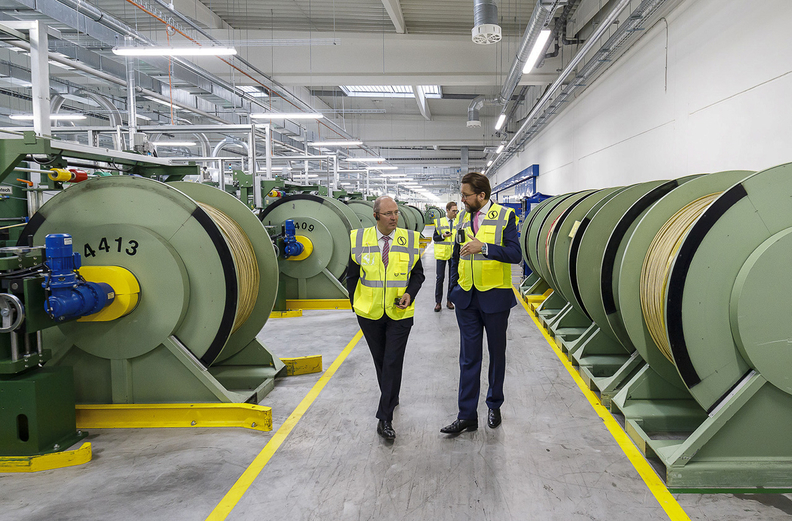 Frank Gumbinger (left), Seperit's chief financial officer, and CEO Martin Fuellenbach tour the newly expanded Odry, Czech Republic, hose facility. Parker Hannifin wasn't the only one restructuring on the non-tire rubber products side. The firm combined its industrial and hydraulic hose businesses into one division, effective July 1—the beginning of its fiscal year. Parker said the move served to simplify products, services and customer experience; support and grow OEM and distribution channels; leverage resources to quickly design, develop and introduce new products; merge technical experience across hose platforms; and refine and capitalize upon manufacturing efficiencies. In a separate move, Parker disclosed plans to close a 28,000-sq.-ft. plant in Kent, Ohio, that is part of its Fluid System Connectors Division. The move will impact 52 workers with production being transferred to a plant in Lakeview, Mich.
Semperit A.G.'s company-wide restructuring and transformation project was expanded to include all business segments within the company in February. The firm said at the time that its Sempertrans and Semperform operations will go through the same process that was initially focused on its Sempermed business, which produces goods for the medical sector, including latex gloves. Sempertrans produces conveyor belts used in everything from mining to heavy industry. Semperform makes construction and industry profiles, handrails, ropeways and rubber foils among a variety of rubber products. The restructuring will focus on four measures—creation of more efficient operational production and procurement processes; improvement of pricing and price-setting processes; reviewing and determining if changes within the business portfolios are needed and if adaptations within the production sites are necessary; and stabilization and sustainable improvement of operational earnings. DuPont currently produces Kalrez- branded perfluoroelastomer parts at a 60,000-sq.-ft. site in Newark, Del. It will relocate production to a nearby facility spanning 120,000 square feet. 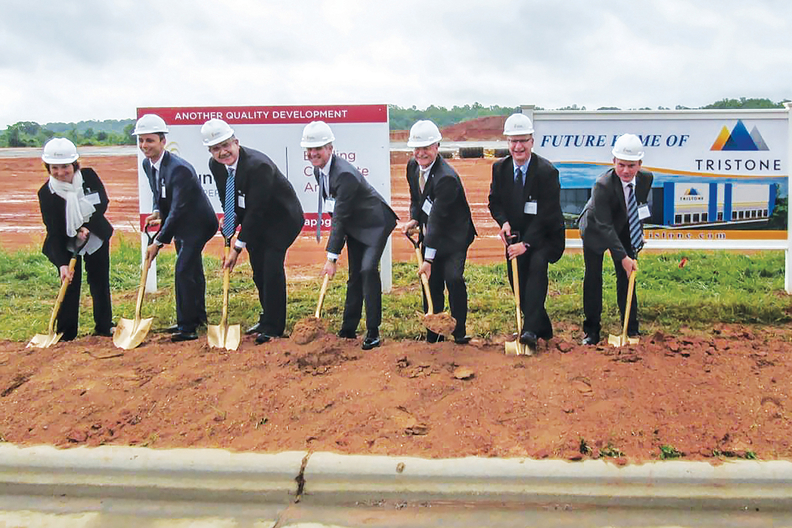 On the expansion front, Tristone Flowtech Group GmbH disclosed plans to add a hose manufacturing facility in Mooresville, N.C. The site is designed to serve the U.S. and Canadian passenger car markets with a product portfolio that includes engine cooling hose systems, air charge hose systems and fluid battery cooling systems. The firm said a plant in the U.S. is needed to help handle its growing business contracts with all major passenger car customers in the North American region. DuPont's Kalrez operation will double in size in the coming years, relocating production from its 60,000-sq.-ft. site in Newark, Del., to a nearby facility that's twice the size. Including equipment, the project represents a $45 million investment. DuPont currently employs 200 at the site, which is projected to increase by 10 percent during the transition. DuPont's Kalrez-branded perfluoroelastomer parts are used to make sealing products like O-rings and bonded door seals. AirBoss of America Corp.'s defense unit saw a spike in business in the final quarter of 2018. Throughout October, the rubber product maker and compounder was awarded four sizable contracts—two from the U.S. department of Defense, one from the Canadian Department of National Defense and another from the Australia Defense Force. Once fulfilled, the four deals are worth a combined $120 million plus any potential revenue from two in-service support contracts the company has with two of the countries.